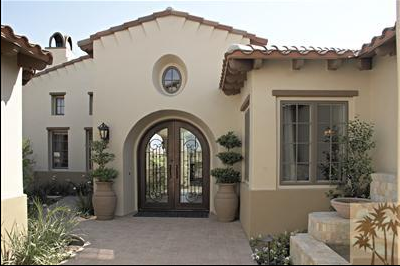 Andalusia La Quinta offers eighteen unique combinations of elevation and plans, finished with a fine level of luxury. Homes range in price from about $1 million upwards to $2.2 million. The architectural environment is one of the Spanish accent of the southern region of Italy throughout this new luxury golfing community. The dramatic guardhouse and the spectacular Racquet Club & Fitness Center shows the heritage of the old days with the beautiful arches, sunny courtyards, cool patios, and painted tiles. Private homes in the Andalusia La Quinta community all have the same type of architectural theme and include wide views of the fairway and sparkling lakes that line the private championship golf course. This course is one of two planned for the Andalusia at Coral Mountain. You will find more than 80,000 lush vegetation types including mature trees, flowers, and lush plants throughout the Andalusia La Quinta East Course championship golf course landscape. Hundreds of the most beautiful date palms sway in the breezes here. Olive trees are grown to be an honor to the Spanish namesake the club holds. A monumental rock waterfall is the welcome site for players as they reach the 18th green. Five sets of tees are available and allow play from 7,521 yards from the back tees, to the 5,489 yards towards the forward tees, will fit within the experience level of any golfer. Only the most dedicated golfer will appreciate the joys of playing this exquisite course. The homes here at Andalusia will be the most breathtaking you will experience in this size and price range. All the amenities you need are available and the course will provide you with an excellent round of golf every time you play. There are eighteen unique combination levels of elevation and plans that come with the homes offered here. Each detail and level of quality is only found in the most finest homes of the La Quinta Luxury Real Estate that exists here. Three to four bedroom homes are available, ranging in size from 2,900 square feet to 5,000 square feet of the most sophisticated living area you will ever experience. Amenities included are open great rooms and 12 foot sliding glass doors that show just how beautiful this golf course really is. If you would like to see property at Andalusia La Quinta, please email us, or call us at the number below. Elaine Stewart is committed to helping you find the home of your dreams.